Our first example of inheritance, DerivedClassDemo, is developed from program ClassDemo on the previous page. This demonstration shows the syntax for creating from the base class Player a derived class ConfidentPlayer. We have a new function Pick in the base class, which will be overridden in an object of type ConfidentPlayer by its own (more favourable) function with the same identifier. The field Msg, the function GetMsg and the procedure Intro in the derived class are not present in the base class. The purpose of a constructor is to perform initialisation. ConfidentPlayer has a constructor to initialise Msg. Hi! My name is Jordan. I feel lucky. You should find this section easier if you are familiar with the material in the Vector Graphics section of our Graphics tutorial. We write a TShape class for a basic shape with the integer fields LineColour and FillColour and the Boolean fields ShapeFilled and ThickLine. All of the derived classes will need these fields and the methods to write (set) and read (get) them. The TRectangle and TCircle classes are derived from TShape, and TCrossRectangle is derived from TRectangle. TCrossRectangle inherits from both TRectangle and TShape. You also need to change Graph to WinGraph in the uses section of Shapes.pas. We show the output below. //If the shapes are incomplete, minimise then maximise the graphics window. Graph; //WinGraph in the Delphi version. //Call the draw procedure in the base class. Write a class based on TRectangle to draw a rectangle split into 4 equal rectangles by a vertical line and a horizontal line. Write a program to use objects of your class. Write classes to draw flags. We suggest that you start with a relatively simple example such as the flag of Poland, Sweden or Japan. Write one program that uses objects of each of your classes. Experiment with methods that flip and rotate your shapes. 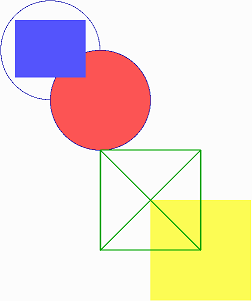 Experiment with 3D shapes, starting with a rectangle.